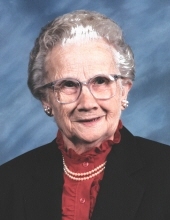 Ruth Moreland Baldwin, 98 of Webster City, formerly of Collins and Farrar, passed away on Friday, April 5, 2019 at Southfield Wellness Community. Ruth was born on August 17, 1920, the fifth of six children, in rural Granger to Perry and Myrtle Cory Moreland. She graduated from the Farrar High School in 1937. Ruth married Wayne (Jack) Baldwin on October 28, 1938 in Unionville, MO and from this union three children were born; Lawrence, Sandra and Debra. Ruth worked as a telephone operator in Farrar and was a dedicated homemaker. She was a member of of the Farrar United Methodist Church. After Jack’s death in 1985, she moved to Collins to be closer to her sister and son. Ruth enjoyed cooking, gardening, jigsaw puzzles, garage sales, reading, walking and sewing. Ruth is survived by her daughters Sue (Jerry) Oaks and Deb (Hap) Palmer; grandchildren Andrea Lowe, Donna (Martin) McCormick, Steve (Joyce) Oaks, Kelley (Shain) Birchmier, Ed Baldwin and Mike (Alyson) Baldwin; great-grandchildren Andy (Taylor) Lowe, Whitney (Josiah) Nagel, Jacob and Abby McCormick, Lauren, Emma and Sadie Oaks, Tanner Ball, Dalton Birchmier, Mary (Michael) Madsen and Jordan Baldwin; sister-in-law Peg Moreland and former daughter-in-law Sandy Lyons. She was preceded in death by her parents, husband Wayne (Jack), son Lawrence, three brothers and two sisters. The family wishes to express their gratitude to Southfield Wellness Community for the loving care given to Ruth since 2008. In lieu of flowers, memorials may be made to the Collins Public Library. The Rasmusson-Ryan Funeral Home of Maxwell has been entrusted with final arrangements. To send flowers or a remembrance gift to the family of Ruth (Moreland) Baldwin, please visit our Tribute Store. "Email Address" would like to share the life celebration of Ruth (Moreland) Baldwin. Click on the "link" to go to share a favorite memory or leave a condolence message for the family.